The obverse side features a head profile of Queen Elizabeth II, in three different versions (it was changed in 1990 and 2009 to portray a more mature Queen). The name of Canada’s Constitutional monarch, the fifty Canadian dollars face value, and the year of issue are engraved on the obverse side. When the Royal Canadian Mint introduced its first Platinum Maple Leaf bullion coin in 1988, the coin's beauty and purity, paired with the RCM’s globally famous manufacturing expertise, made it an instant success. 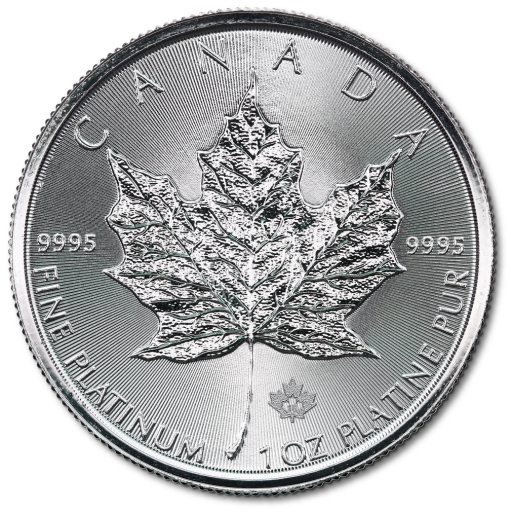 Since that first release, the Platinum Maple Leaf bullion coin has been minted at a purity of 9995 platinum in 1oz, ½ oz., 1/4 oz. and 1/10 denominations, while 1/20 oz. coins were issued between 1993-1999. The platinum Maple Leaf adopted the same esteemed Walter Ott design which was launched on the gold and silver series, the one showcasing the popular symbol of the largest country in North America. Only 500 sets of hologram platinum Maple Leaf coins (including all five denominations) were minted in 2002. No platinum Maple Leafs were minted between 2003 and 2009, when the 1 oz platinum Maple Leaf was reintroduced. Nevertheless, the 25th Anniversary of the series was celebrated with a superbly designed gold-plated platinum coin printed in a limited edition. The RCM uses the latest technologies, meticulous quality control and advanced safety measures to mint the Platinum Maple Leaf. Each coin is manufactured to meet the high quality standards of the Royal Canadian Mint, and the weight, purity and face value of each coin are guaranteed by the Canadian government. The coin’s high-tech printing, together with its widely publicized design and precise specifications make forgery impossible. In the case of Platinum Maple Leafs, experienced dealers can recognize an original when they see it. As leading distributors of Platinum bullion coins, CoinInvest offer highly competitive rates on 1oz Platinum CAD $50 Maple Leafs, and with limited resources available, we strongly suggest you place your order at the earliest convenience to avoid disappointment. To purchase your 1 oz Platinum Canadian Maple Leaf coins, simply sign into your CoinInvest account, and add the items to your basket by clicking on the orange strip in the volume pricing section. If we have the coin in stock, we will process your order at the earliest convenience. If you have any Platinum Maple Leaf coins for sale contact us and we will be happy to discuss a price with you and prepare a fixed fee offer for a limited time only. We will send you confirmation of the offer by email.